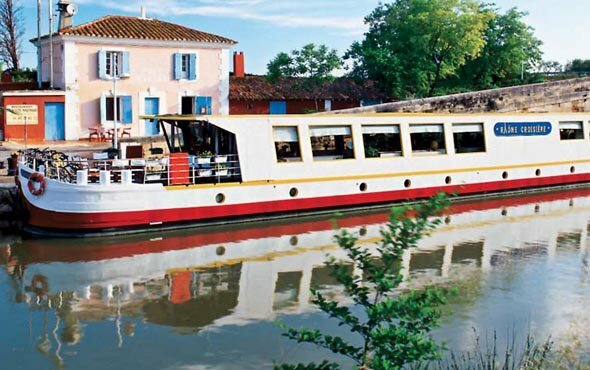 ‘Le Phénicien’ floats lazily along the waterways of the Carmargue, meandering through Province and the Languedoc wine region, passing stunning countryside and local residents going about their daily activities. Disembark for a visit to medieval, cliff-top Les Baux-de-Provence, taste award-winning wines at Châteauneuf-du-Pape; visit the ancient Roman aqueduct Pont du Gard and tour the historic Palais des Papes in Avignon. Itineraries with unique themes, such as cooking, cycling, golf or wine appreciation can be arranged for parties with special interests.